(courtesy The Pink 'Un via Kevin Ford). In the article about the Early Years of Box Rovers, we recorded how the senior side won the Wiltshire Junior Cup in 1953 and were Wiltshire Division 2 champions in 1954. After these successes there was a new beginning for football in Box. For amateur sides like Box, there was an influx of new, younger players and more opportunities for youth teams and Sunday leagues. In the Sunday Leagues semi-professionalism was accepted which resulted in some very strong sides. The first game in the 1954-55 season showed that things were changing for the worse. Rovers were soundly beaten 2-4 by Frogwell, compounded by defensive errors between goalkeeper and centre half. With a younger side the attack was strong but the defence leaky. It continued in this manner with high scoring results in the 1958-59 season, beating Calne Corinthians 4-1, then a see-saw game against Westcott Youth winning 5-4 with John Harris scoring twice as Box swarmed to the attack in the second half. Similar results followed: 5-0 against Sherston, 5-5 against Swindon Victoria when the opposition took the lead five times and were pegged back on each occasion. The results continued similarly: 8-0 against Marlborough Town, 6-1 against Roundway, 8-2 against West Lavington but 3-3 against Bromham and a dismal defeat 10-0 to Wootton Bassett to end the season, when Tommy Boore, a former County player, had to switch from inside left to stop-gap goalkeeper. The senior team was somewhat left behind by the split between semi-professionals and complete amateurs (like Box). Rovers wore a kit of red and white stripes with shirt tails and button-up collars, which they changed into in the rooms above the lavatories opposite the Queen's Head (now the Old Sweet Factory). The Box Rec pitch was very heavy with a wooden hut for storage on the Lower Rec and at half time Arthur Boulton would take round a collecting box to pay for transport to away matches. Sunday football was just taking off with the Chippenham Sunday League, which attracted a number of very strong sides with semi-professional players from higher teams like the Saturday Western League sides, Devizes Town, Melksham Town and Chippenham Town. Box Parish Council was one of the first parishes to allow Sunday sport on public land when in 1965 a Box Sunday team was formed, kitted out in Old Gold and Black colours as a reference to Kevin Ford's favourite Wolverhampton Wanders team. Called Box Youth the side featured a number of younger players born after the Second World War and started in the Second Division of the Chippenham Sunday League. Rovers players, Ken Boulton and Bernard Lovell, were both keen on promoting sport for Box boys through local Boys Club and helped to organise the youth side. There were some good results in the 1967-68 season. The season started with a few hard-fought matches including a two goal recovery to beat Corinthians 3-2 in September 1967. It was a turning point and a more attacking system produced some remarkable results: an over-whelming 9-0 victory at home against Buxted B with every forward scoring and Chris Phillips scoring a hat-trick before half-time. In November 1967 the team beat Ladyfield 10-1 at home and in January 1968 they secured a 5-1 away victory when Richie Robson easily Box's best forward scored all five. The highest score was a 13-0 away victory on 31 December 1967 against Chippenham Rovers B side. The team never matched the scoring power of Black Sports (who beat Ladyfield 17-1) or the Red Lion, Melksham, but they came a creditable third in the league. The secret of their success seems to have been mixing experience and youth. Both Robin Sawyer and John Howell played all 24 matches that season; youngsters Tony Jacobs and Ken Packer on the wings wrought havoc to opposition defences. Grayston Dancey (18 goals in 13 games), Richie Robson (22 in 21 games) and Chris Phillips (13 in 13) were Box's leading goalscorers throughout the 1967-68 season. Success and promotion came in the second year with 15 wins, 3 draws and 6 losses. Victory over Corinthians 6-2 was followed by wins 13-1 against Chippenham Celtic, 8-1 against Ladyfield United and 7-1 against Seagry B. Richard Robson scored five against Chippenham Celtic, six hat-tricks to end the season with 35 goals, Tony Jacobs 14, Chris Phillips 13 and Kevin Ford 11. Life in Division I proved much harder in 1969-70 with 8 victories but 14 defeats including a mid-season run of nine losses and one draw. It was all rather disappointing. Alec Cogswell took over the management of the senior Box Rovers team in 1969. There were many noticeable achievements during his managerial term from 1969 up to 1976. 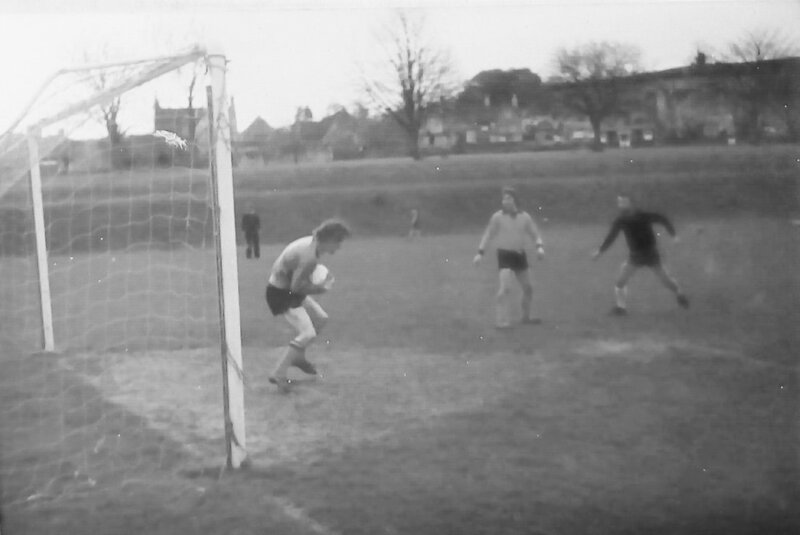 In 1972 the two top teams in the division, Swindon Walcot and Box Rovers, took part in the first televised match on the new Swindon TV cable network. 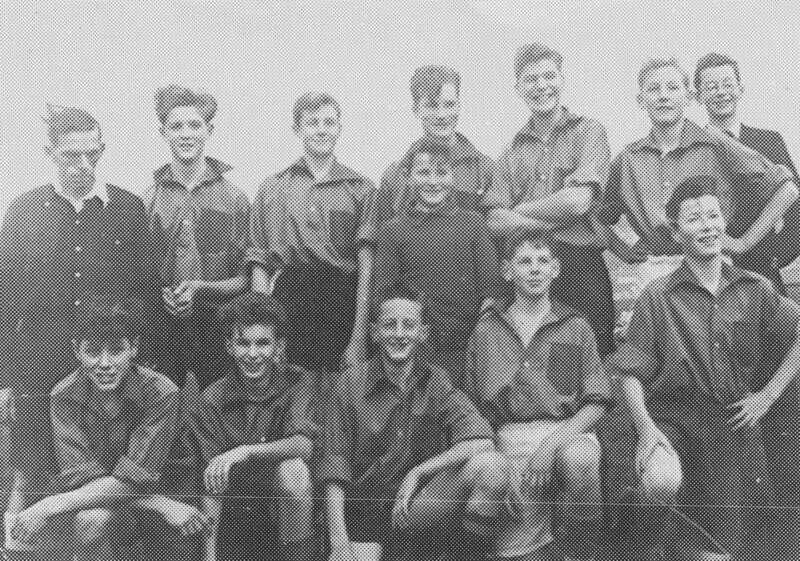 The Boys Team continued to make a contribution to football in the village under manager Mel Bush, seen top right. The club was very well supported and a crowd of some four hundred people saw the Rovers defeat the favourites Wingfield in the cup final at Avebury. Alec Cogswell was particularly proud that his three sons took part in that game. The club lost a real stalwart in Robin Sawyer, who died tragically during a reserve Box Rovers match at Westbury on 12 October 1974. There was a huge response from the club and community. 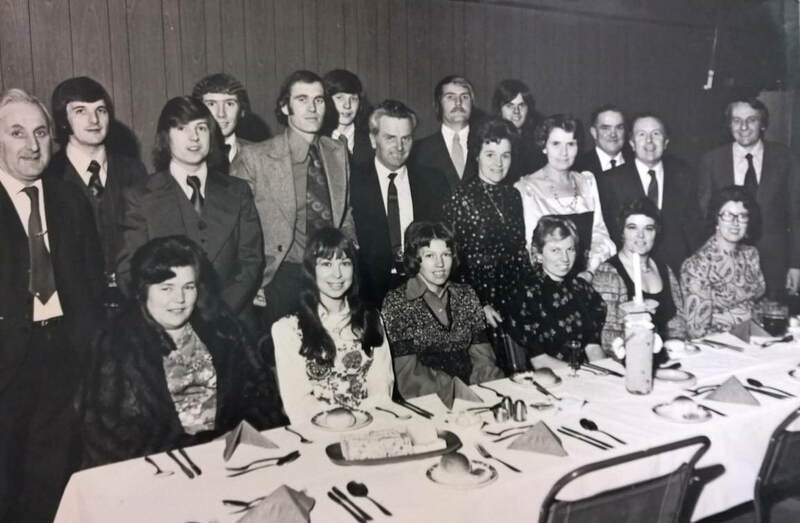 A dance was organise by Graham Cogswell in the Selwyn Hall, attended by some 300 people with proceeds going to commemorative seats on the Rec and a cup. The first Robin Sawyer Memorial cup match was between Box Rovers and Box Youth Easter Monday 1975. A number of players, played for both teams normally. Above - With the inaugural Sawyer Cup. 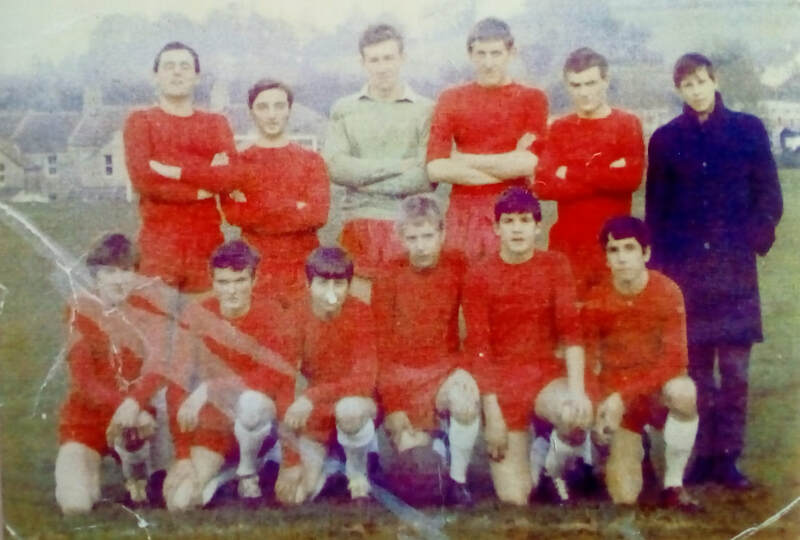 From left – Andy Guy; Andrew Kerr; David Jones; David Williams; Stephen Andrews; Richard Guy (behind, partly hidden); Jimmy Perrott; John Portnall; Graham Cogswell; Mr Perrott (referee) Richard Robson; Wally McCarron; Billy McCombe; Jimmy Trainer; John Gingell; Paddy O’Connor; Bruce Cole; Alec Boore. The club flourished on and off the pitch. Results were consistently good and, when it was dry, the pitch was one of the best surfaces to play on in the region. From left - Mr Boore; Gerry Peblow; Robert Hall; Graham Cogswell; Jimmy Trainer; Bob Miller; ??? ; John Gingell; Hilda Lovell; David Williams; Gleneese Cogswell; Alec Cogswell; Bernard Lovell; Stan Scarth Front row (sitting) – Mollie Boore; Mrs Hall; ???? ; Mrs Peblow; Mrs Gingell; ??? A mixture of the Saturday and Sunday teams went on a two-match tour of Lloret de Mar, Spain in 1977. Kevin Ford recalled a disco in the hotel when Charlie Davis spilled a whole round of drinks and had to buy another round. He also tells of a trip to Montserrat to see the Black Madonna there when Charlie's camera jammed to his annoyance and he never got a photo. No-one seems to remember the results of the games; I wonder why. As the team grew older, players slowed down and moved to less physical positions. Kevin Ford started as quick centre half in a match against Dowty Reserves in the 1960s when Rovers were soundly beaten 4-1. The newspaper report of the game read Young Kevin Ford played an intelligent game. By 1980 he had become a rather static goalkeeper but the photo below shows him making a rare action save. Some of the best players at this time were Bruce Coles and Alan Trudgeon. Bruce has been described as a great winger, great chap. Alan Trudgeon was a prolific goalscorer and still holds the record as the Wiltshire Combination leading scorer. John Howell was a very good footballer, who went on to play for Chippenham and Melksham. His mother lived at Bargates, Box. John Howell’s father (Doug) took over as manager after Alec Cogswell. In those days Rovers even had a coach to take supporters to away matches, which was quite unbelievable for a Sunday league team. he didn't get on with them and he branched out on his own. He became a very successful ground worker, a smashing bloke. John McAlister, another good footballer, who eventually went to live near Frome. When John was a boy he used to have a calliper on his leg. He became a very good squash player. Ken Abrahams and Cyril Greenland both went on to play semi-professional football. An RAF serviceman stationed locally played for Rovers and went on to winner's medal at the Amateur Cup Final at Wembley. He only played for Box for two seasons. There is also a legend, known by all Box Rovers players, of Charlie Davis' reputation for injuring players on his own side. The most famous was breaking Johnny Welsh’s leg in a collision. Sadly Johnny is no longer with us, one of the thirty Britons tragically killed in the Tunisian terrorist attack at Sousse beach in 2015. 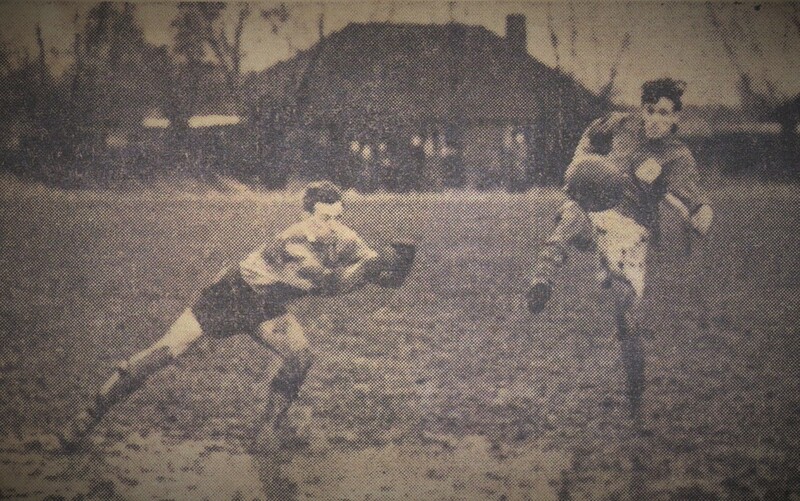 Alec Cogswell was connected with Box Rovers FC for over 50 years. He was at different times chairman, treasurer, secretary, manager, kit-man, pitch marker and linesman. He helped form the club in 1949, was still playing in the glory years of the 1950s and manager in the 1970s. For a long time his name was synonymous with the club. Equally, he helped to popularise football for young Box men and the villagers in general. Alec retired as manager in 1976 but continued to support the club and he was linesman for a further twenty years. His love of football continued throughout his life, through his sons and grandsons, always there and always supportive. He was a proper referee for a few years and used this when running the line for the Rovers, the Box Sunday team and also his grandson’s team at Corsham Boys FC. He was absolutely fair, which sometimes led to a few debates at the end of a game, mainly around the offside rule! He was also there with help, huge support and advice when Graham led the £1 million Leafy Lane Project at Rudloe, providing 28 acres of sports fields and changing and related facilities. This was particularly targeted at youth football and sport and became the home of Corsham Boys FC (now Corsham AFC). Alec was never Roy Race. As they say in football-speak, "He was much more important than that for Box Rovers", bringing pleasure to football supporters and the whole of Box village !